As part of the global celebrations of the centenary of Girl Guiding and Girl Scouting, the World Association of Girl Guides and Girl Scouts (WAGGGS) held three major events for girls and young women. For the first time ever WAGGGS held a forum, one taking place each year, in a specific location around the world. 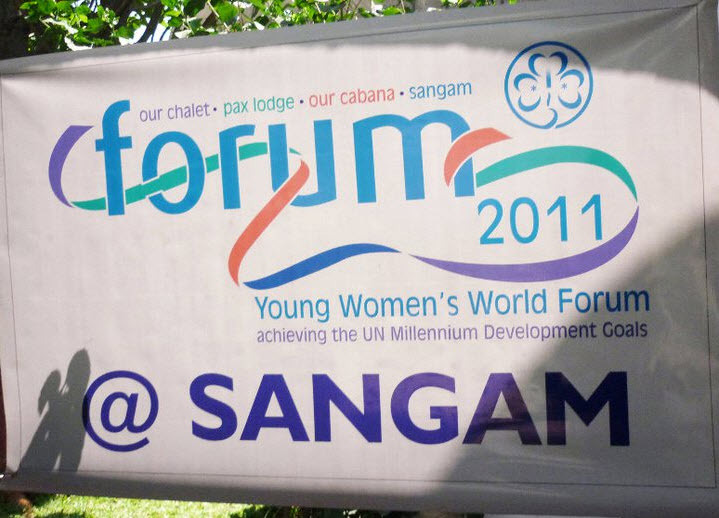 From October 19-24, 2010 Girlguiding UK hosted the first Young Women’s World Forum (YWWF) in collaboration with WAGGGS. In 2011, WAGGGS hosted the YWWFs in the four World Centres which held four simultaneous events. Canadian GGC Members Ali Peters and Mandy Thompson were selected from several applicants to attend the WAGGGS Young Women’s World Forum 2011, which took place at all four world centres. The women were assigned the Sangam in India. This is a gallery of some of the many fantastic photos of the trip! A huge thank you to Ali for providing us with these wonderful photos! Gallery | This entry was posted in Global Guiding and tagged international travel, Sangam, WAGGGS, YWWF. Bookmark the permalink.